The Chinese New Year (also celebrated as the Lunar New Year) begins on 5 February, kicking off a host of events to celebrate the Year of the Pig – an animal that symbolises wealth, good fortune and general prosperity all round. What better reason to get in on the action? Here’s the top places in Australia to celebrate Chinese New Year in style. This February, the celebrations are lining up at, with a carnival of festivities set to take over Sydney, Brisbane and the Gold Coast. The Star Sydney, Treasury Brisbane and The Star Gold Coast will come alive as they celebrate the Year of the Pig with stunning festive theming and entertainment, unforgettable banquets and unique dishes starring across The Star’s signature dining destinations and bespoke events. From a sumptuous six-course banquet in collaboration with iconic Cantonese restaurant The Century to magical Brisbane night markets with Luke Nguyen; firecrackers and lion dancers to Chinese lanterns and interactive wishing trees; The Star will be the most thrilling destination to celebrate Lunar New Year 2019. This summer, Sydneysiders and visitors will be able to immerse themselves in the sensational New Year festivities of Asia without leaving Sydney. For the first time ever, Chatswood is hosting a three week long cultural festival, Chatswood Year of the Pig Festival from the 29th of January to the 19th of February. The festival will include a variety of cultural events and performances that will transport visitors to celebrations across China and other Asian destinations. Get excited for the Golden Market, a traditional end-of-year food and fashion market, and the Lunar New Year Twilight Parade, a traditional Chinese New Year street parade. Other highlights will include the Taste of Asia Food Tours, guided journeys eating Asian delicacies at local food hot spots, and Flicks for Piglets, free screenings every evening of Chinese and English films for families. Chinese New Year, Celebration Day and the Chinese New Year Art Exhibition will also be visitor attractions on the Festival calendar. Sydney hosts the largest celebration of the Chinese New Year outside of Asia, with over one million visitors expected to participate in events planned around the city. Main attractions include the Lunar Lanterns festival, where the 12 signs of the Chinese zodiac come to life in the form of a display of giant, illuminated animals positioned along circular quay. Start the tour of the lanterns from the Sydney Opera House, working your way around Circular Quay to the Rocks. Once you’ve seen the installations, have a shop and a nibble at the Rocks Lunar Markets. Neil Perry’s modern Chinese restaurant Spice Temple is bringing in the New Year with a nine-course banquet of auspicious dishes, utilising ingredients that promote wealth, health, happiness and other good fortune. Of the meal, available from Friday 1 February to Sunday 10 February, executive chef, Andy Evans, says: “Lucky food is the centerpiece of our Chinese New Year menu, designed to give blessings for the next year”. Diners can expect classic Chinese dishes, including long noodles that represent a long life and pippies, which represent fortune (I’ll have seconds of those please!). Don’t miss the Darling Harbour dragon boat races, where 20 participants race 20-metre-long boats to rhythmic drumming. The dragon, a symbol of prosperity, belongs in the ocean and the clouds and is said to control the rain, making this an important event practised by the Chinese for more than 2000 years. Sydney’s Chinatown will also play host to an array of goings on during the Lunar New Year. Red, gold and pink lanterns will be suspended in a glorious cloud of yellow light as dusk hits the city, making for a great photo opportunity. And don’t miss a traditional Lion Dane, performed in a burst of colour to a backdrop of thundering red fire crackers during Sydney’s Chinese New Year festivities. Melbourne’s Chinese New Year festival will see an array of colourful and cultural events take place as a part of the Cultural Kaleidoscope program: Chinese chess competitions, gods of fortune photo ops, Chinese drum practice, Chinese calligraphy workshops, a 300-person flash mob plus a healthy dose of noodles on the side. The festival spans 15 days and features a range of events that pay homage to the sounds, flavours and cultures of Asia. 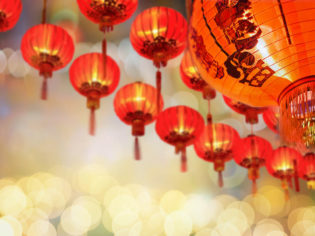 Begin the Chinese New Year with a bang with a party at Queensbridge Square in Melbourne’s Southbank. Expect stage performances, kung fu, firecrackers and costume parades. Add some Chinese food and a few baijiu bevvies, and you can have yourself a Chinese New Year’s Eve you will never forget (unless you have too many baijius, in which case, no promises). Gear up for the Dragon Boat Regatta celebrated in Melbourne’s Docklands. With the same principle as the one in Sydney, this is an ancient festival dating back 2000 years, said to bring prosperity to the city. There is an official race for regatta members and professional rowers, but this year also has an inclusive twist – any community group, company, group of friends or family are allowed to enter as a team to participate in this ancient tradition – making this a social event that can’t be missed. Spice Temple Melbourne is hosting a series of nine-course banquets to ring in the New Year. The banquets boast a bundle of glorious Chinese dishes: roast pork belly with black fungi and pickled green chilli to bring money, mapo-style red-braised duck to promote peace and stir-fried mung bean noodles with blue swimmer crab to improve your love life. The saying goes that you are what you eat, which supports the very notion of this banquet – so make a booking to ensure a prosperous year. The Happy New Year China Village will be setting up shop as part of Canberra’s annual multicultural festival. The China Village will feature performances, stalls with delicious Chinese cuisine and crafts, and decorations to celebrate the Lunar New Year. Enjoy the colourful, illuminated, Chinese lanterns at dusk, during the Lantern Festival in the Beijing Garden at Yarralumla’s Lennox Gardens. The lanterns will light up the sky in a glorious display, creating a beautiful atmosphere to end the celebrations. Make your own to bring to the festival at Cook Community Hub’s lantern-making workshop on Sunday 10 February; $3 per person. Chinese New Year is best experienced through food, with Chinese cuisine marking one of the most celebrated cuisines within Australia. Head to the Lanterne Rooms for special Lunar New Year banquets (5–16 February), Natural Nine at the Canberra Casino for some Chinese dancing and food (5–10 February), Chairman and Yip for Chinese New Year tasting menus (5–9 February) or Wild Duck for its Golden Pig Banquet (4–9 February). Held on Hobart’s Parliament House lawns, this festival is full of activities to ring in the Chinese New Year. Expect on-land dragon boat races, entertainment, Chinese food stalls, five-metre-long fire crackers and more. A collection of artwork from ethnically diverse artists explores responses to Chinese art and culture. Organised by Chinese Contemporary Art Tasmania, the installments include a variety of mediums: photography, painting, video and installation, all paying homage to everything Chinese. Pop down to Brooke Street Pier to see this amazing showcase of talent. Start the celebrations early with a performance at Wrest Point Entertainment Centre, Sandy Bay; a colourful procession of dancing and oriental song. The 16th Lunar New Year street party promises to paint Adelaide’s Chinatown red in a celebration of the east. Stalls are heading to the streets full of everything Chinese: food, crafts and culture. Expect lanterns, drumming, on-stage performances, lion and dragon dances and fire crackers. Head to the Adelaide Festival Theatre for cultural workshops hosted by the Confucius Institute. The free workshops include Chinese story time, cultural infusion music and Chinese mask-making workshops. Hosted by the Chung Wah Society of the Northern Territory, the Chinese New Year Festival promises to be a true tribute to everything Chinese. There’ll be food and drink stalls, an immersive and interactive look at Chinese history, colourful performances of traditional Chinese dancing and music as well as plenty of activities. And with celebrity chef Adam Liaw and local chefs Jimmy Shu and Danny Yeum also on hand to demonstrate their skills in Chinese cuisine, this is a two-day event that should not be missed when in the NT. The Chinese New Year Gala Ball is the perfect place to celebrate Lunar New Year, with a celebrity chef involved in the creation of the Chinese banquet served during the evening. With premium food and drinks, grab your ticket to guarantee a brilliant, colourful and immersive evening. An on-street celebration of the east in Northbridge, the Chinese New Year Fair promises stalls, food, craft and dancing. What it offers, that other states celebrations do not, is a collection of rides that transform this celebration into a cultural experience/fun fair hybrid. During the entirety of the Chinese New Year, Fortune Five Chinese Restaurant will be doing delicious banquets for groups of 8 or 10. So gather a few of your pals to sink your teeth into some almond chicken stuffed with seafood, scallops with snow peas and mango sago dessert. Cairns’ Grafton Street will be transformed into ‘little Chinatown’ for the Lunar New Year. 15,000 visitors are expected to visit the city to witness the vibrant street festival, which ends with a magical firework display. Ensure your view of the fireworks via helicopter ride or a Chinese New Year hot air balloon tour in order to make the Year of the Pig one to remember. Colourful entertainment, Chinese food stalls and cultural workshops are only some of the things on offer at this year’s BrisAsia Festival’s Lunar New Year celebration. Hosted in Fortitude Valley’s Chinatown Mall, events will include Tai Chi Qigong demonstrations, Filipino dance shows and even performances by ‘Chinese grandma clown’ Anna Yen. With a range of performances expected on the Cavill Mall streetscape between 5pm and 7pm, including Chinese flute, the ancient dramatic art of face changing and a lion dance performance, this is a great way to be entertained in true Chinese fashion ready for the New Year. King Tea is hosting a Chinese New Year’s Eve banquet – boasting a very pig-based menu to celebrate the Year of the Pig. The Golden Pig Banquet costs $70 and includes a glass of sparkling, beer or wine on arrival and a lot of pork. Expect to leave very full, and fortunate, as you ring in the Chinese New Year.